so your summer is going well, but that big storm hits and you lose power in the house. Sometimes it’s for an hour. Other times it could go all night. But fear not, because there are some simple things you can do to get through a hot, sweltering night and still have some creature comforts of home! I get a lot of these at conventions – seems to be the new swag. The idea is to use these things to charge your phone when it’s down to 10%. Some can get you back to 50%, some can fully charge your phone 2-3 times. I have used many chargers. One in particular is the MyCharge Razor. 6000 mAh will allow you to keep a phone charged, and also turn it into a power source. Need even more power? Check out the Jabra Soulmate Max – a Bluetooth speaker that can also charge phones. It is a great way to watch a movie from your phone or tablet with decent sound and keep it charged as well. This device will keep a full charge up to 130 days, so you don’t have to keep it plugged in. At $230, it’s pricey, but definitely will keep you going. Onite USB LED LightBattery powered flashlights can fail. That is why I have this Onite USB light bulb. It’s perfect when you need to add light somewhere and hangs up so you can use it for power outages, camping, in the garage, under the car hood, and more! These lights can go hours on the USB chargers I just mentioned. What if you are dieing of heat? Well check out this USB fan! I plugged it into the Razor and it kept spinning for over 8 hours! It’s not air conditioning, but if you can’t sleep without a fan running, this can at least help you with that issue for the night. Remember, if you have a car, you have a car charger. Some of these batteries can be recharged that way if the power outage lasts longer than one night. 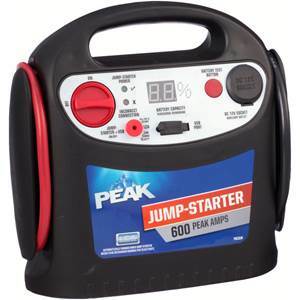 I bought this Peak Jump Starter for car issues. However, that USB port can also be used to charge a phone or power any of these USB items. This one has 600 amps, but you can get larger versions if you need more. Of course, you can get LED candles in packs of 12 for $7. More stylish ones for a little more, but they all do the same job. And they don’t pose a fire hazard or melting wax issue. Of course, longer outages might need a longer-term solution like power generators, solar panels and propane lanterns. But for an 8 hour outage, these items will help you keep going until the power comes back on.